Last week the streets of Christchurch saw what was proclaimed as the largest white nationalist march ever to hit New Zealand. Charles Anderson finds out why the city is so attractive to right-wing groups. For evil to prosper all you need is a good dose of sunshine. So it was on a bright Christchurch day last weekend when men adorned in black T-shirts, camouflage pants and with their heads shaved took to the streets. Alongside them were women pushing baby strollers, and displaying signs that declared, among other things, that it was all right to be white. A lone protester to the march stood on Deans Ave, walking stick in one hand, DIY sign in the other. His read: "Please respect people of all cultures, ethnicities and colour." Another man, who 640 people like on Facebook, was front and centre in Christchurch last week. Kyle Chapman was presiding over what he proclaimed was the most successful right-wing march ever in New Zealand. There was, he said, about 115 people. Its success, Chapman claimed, was down to a prevalence of sunshine and "a scarcity of communists". Back from self-imposed Mormon obscurity in Hamilton, the Right Wing Resistance, under Chapman's reign, has amassed what he believes to be the most money a far right group in New Zealand has ever saved – $13,000. The recruits are growing, he says, though Chapman will not discuss specific numbers. So is there a resurgence of some slow-simmering bed of bigotry? 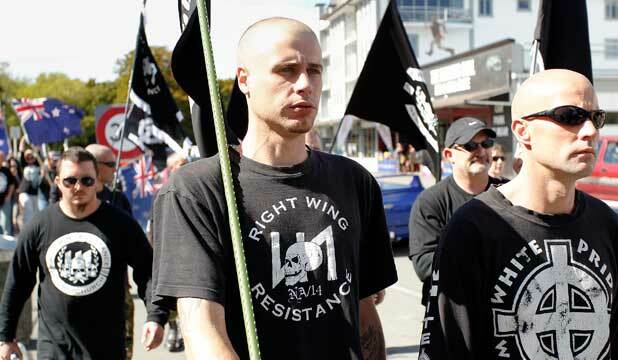 Joining Right Wing Resistance on the streets were also stalwarts to the white nationalist movement – Blood and Honour, National Front, Southland Skinheads and Independent Skinheads. "We have seen it in other countries," said former Christchurch Central MP Brendon Burns. "Fanned in the right direction, with the right economic and social circumstances, it can take hold. Obviously Christchurch is going through its most difficult time yet." Burns had first-hand experience with Right Wing Resistance last year when Chapman and a balaclava-wearing cohort crashed an electoral candidates' meeting on Worcester St.
"My first thought was, 'What on earth is going on'?," Burns said. "When Chapman began his monologue it was clear what he was trying to do." Chapman was complaining about not being listened to. "It was designed to intimidate and I think that's what they are about," Burns said. "There is not a big movement for them but, from time to time, issues may flare up that feed their support." Last Saturday's march was timed to coincide with World Race Relations day. The earthquake hampered any large celebrations in the garden city, but writing on its blog, Christchurch Libraries said: "Now more than ever it's important to remember the many cultures that call New Zealand home, and support each other." However, Chapman told the Sunday Star-Times the earthquake had, in fact, helped them. People were looking for a safe environment. His group offered that, he said. Chapman said Right Wing Resistance was about creating a place where people could be taken care of. It was about "fighting that politically-correct crap". It was about fighting dodgy politicians lying to New Zealanders. It was about a warning. "As long as the politicians keep going like that, groups like us are going to keep growing, and they are going to grow more militant." Hence the balaclavas. Not only does he plan on using similar tactics to those used against Burns on MPs, who he sees as being particularly dodgy, the Right Wing Resistance is also branching out into other causes. It plans on protesting the Food Bill, because Chapman believes it is only a matter of time before the government starts telling people that they can't grow food in their own backyards. The protest is planned for Rangiora, and he's looking for more organisations to lend their support. But it was racism, not garden seeds, that was identified as an area of concern in submissions to the the Christchurch City Health and Wellbeing Profile published last year. Massey University sociologist Paul Spoonley began his research into extreme right wing groups in the early 1980s and was always puzzled as to why so many of them were based in Christchurch. He explained it by saying our "most English of cities had a strong sense of attachment and tradition ... but it also harboured some groups that took these attachments to an extreme". By the 1990s, Spoonley said, these groups had become established in a number of gangs that were marked by their use of Nazi ideology and symbols. A group like the Fourth Reich, established in Paparua prison, was a case in point, he said. Most members tended to be young, male, disaffected and involved in criminal activities. "Christchurch continues to have the dubious honour of being the home to the largest number of extremist and white supremacist individuals and groups in New Zealand, a tradition that is now more than 30 years old." Race relations commissioner Joris de Bres said racial prejudice in its many forms continued to frustrate the achievement of positive race relations, but he did not think Christchurch suffered overt racism any more than other areas. But recently, there have been some high-profile race-based attacks. Jared Peck, shaved head and skull tattoo on his neck, was sentenced last year to two years in prison after he and a group of other men attacked at least five Asians on Riccarton Rd. A Japanese man returned home and told people they should be cautious about travelling to New Zealand. A Chinese victim was attacked three-on-one and had his jaw broken. Last Easter Sunday, two people used their dogs to attack Asian people while they were walking on Lincoln Rd. Earlier this month they were jailed for eight months. Eighteen-year-old Phillipa Ann Parker and her ex-boyfriend Steven Brian Donaldson, 25, both admitted the attacks had racial overtones, but said they had stopped associating with the white supremacist group that fostered such attitudes. Casey Ryken joined Right Wing Resistance a year ago after being involved with various skinhead movements. He said every other group wanted violence to achieve its ends, but Right Wing Resistance was doing something good for the community. "I've never been into the violence, it makes all white nationalists look bad." He moved from Hawke's Bay to Christchurch because groups had the freedom to operate without fear of reprisal. "In the North Island if we had a white pride march we would just get attacked. It's a lot safer to do it down here." Ryken said that most people thought being a white nationalist was akin to being a "racist Nazi". "But that's not the case. We want our country to be free. We just want our heritage back." An Asia New Zealand report said that while Christchurch's Asian population would continue to grow, the city would continue to be known as the Britain of the South Pacific, but like Britain itself, it would continue to diversify in terms of its ethnic population. "The physical, transitory and cultural ethnoscapes representing the various Asian populations will continue to evolve," the report said.